With equities building moderate gains, especially in the latter part of the day, the VIX continued to melt lower from the Thursday high, settling -5.0% @ 14.85. 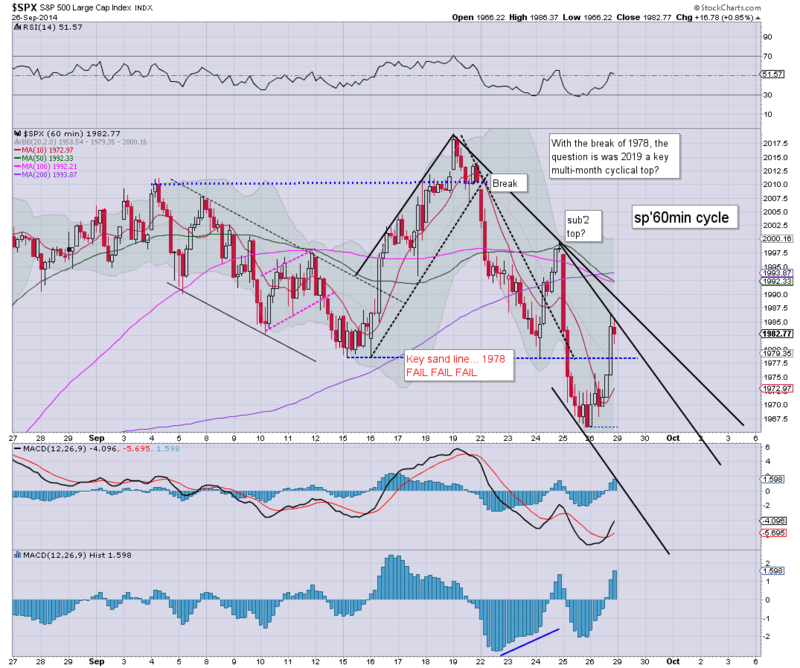 Near term outlook offers a jump into the 17-19s... the 20s still look difficult, even if sp'1930/20s. It was not surprising to see equities rally today, and indeed, my original target zone was for a retrace to 15/14.80. The afternoon low of 14.31 was marginally surprising. Considering the truck load of technical breaks on Thursday, I'm now seeking further VIX upside, which should at least take the VIX to 17, perhaps 18/19s. The 20s still look difficult though. US equities closed moderately higher, sp +16pts @ 1982. The two leaders - Trans/R2K, settled higher by 1.2% and 0.8% respectively. 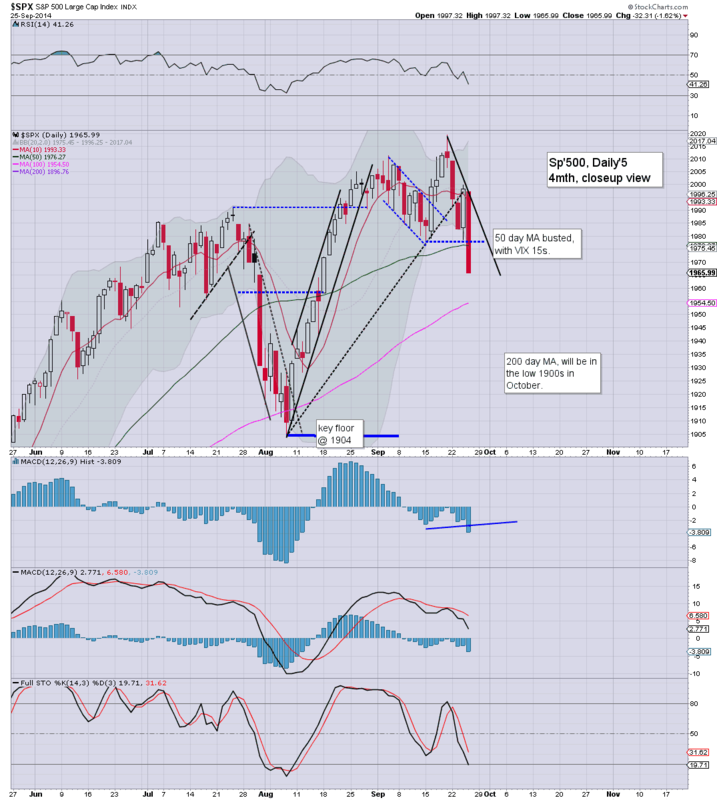 Near term outlook is for renewed downside, breaking the Thursday low of 1965, with first target zone of 1950/40s. ...and another week in market town comes to a close. Certainly, no one can say this week was boring. We've seen continued weakness from the Alibaba high of sp'2019.. down to 1965... with an end week bounce to 1986.. but cooling a little into the close. *I am holding short across the weekend, seeking 1950/40s... with a 'best bear case' target zone of 1920/00. 3pm update - bounce complete? No doubt this afternoons little wave into the sp'1980s has really rattled many of the bears, but still, it does not negate what happened yesterday. *I am short, will hold across the weekend. 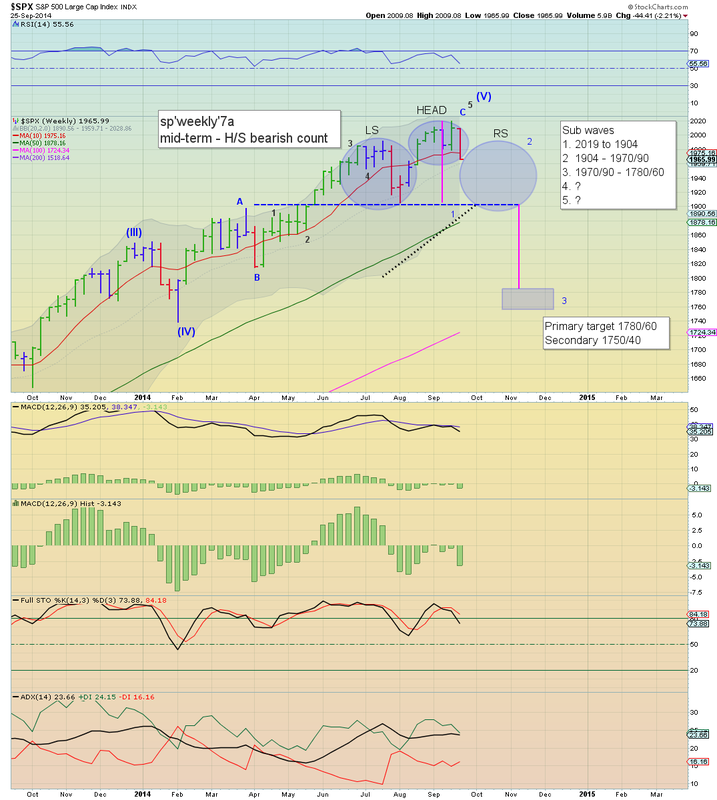 With the weekly MACD cycles continuing to tick lower, next week looks promising for at least a move down to 1950/40. US equities continue to slowly build moderate gains. A back test of sp'1978 remains a very likely hit before the close...likely equating to VIX around 15. Metals remain weak, Gold -$6, with the miner ETF of GDX -1.7%. I remain standing by to launch an index-short around sp'1978, with VIX 15s. Stay tuned.. my most excellent of readers. 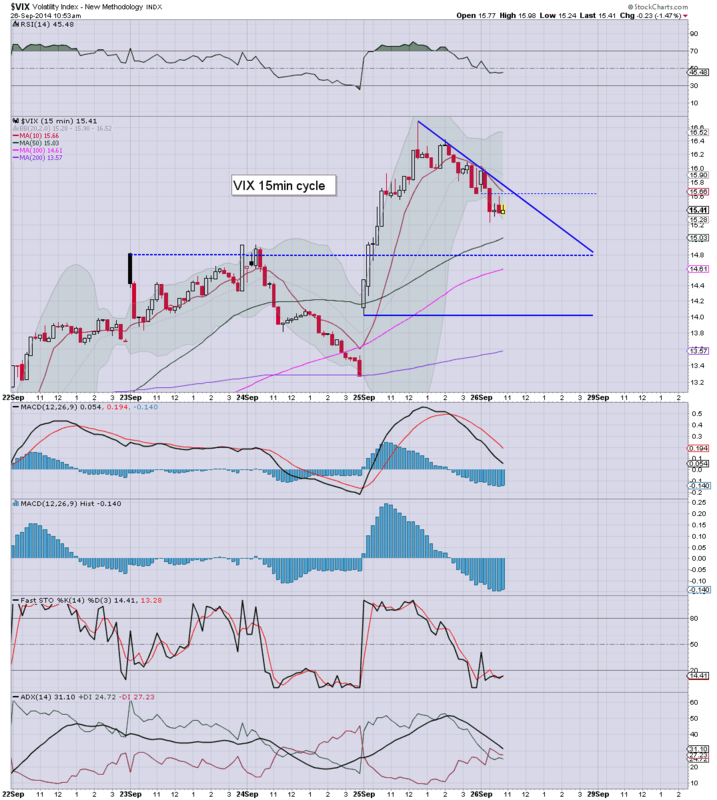 2.02pm.. almost there.............. VIX 15.02... effectively AT target zone. 2.04pm.. IN TARGET zone.... eyes on 5min cycle...standing by to short into the weekend.. for a gap lower at the Monday open. 2.09pm.. SHORT from sp'1978... will hold into next week. 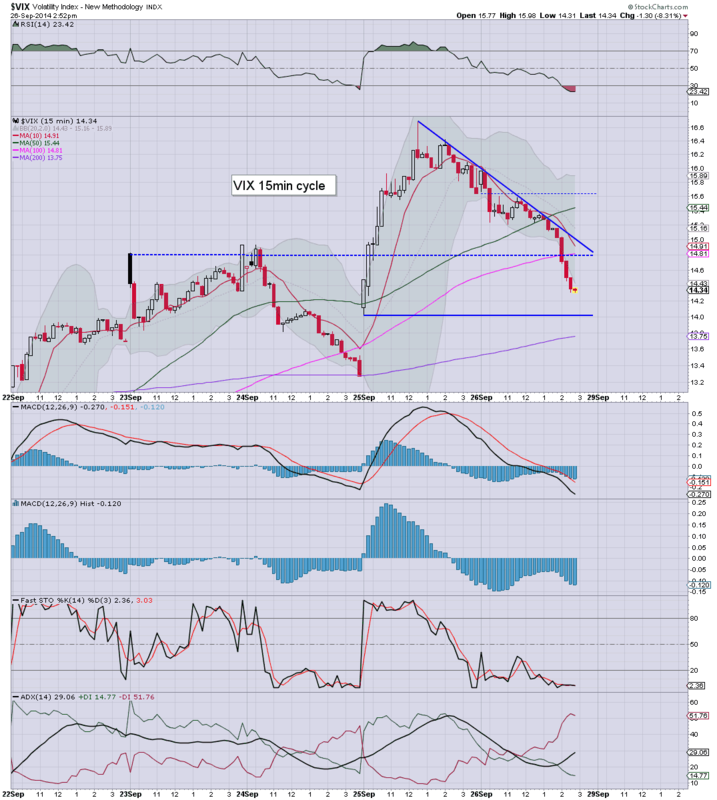 2.11pm.. We remain in the target zone of 1978/80... with VIX 14.70s.. having snapped lower just now. Certainly, it took some time... but we got there. 2.18pm. 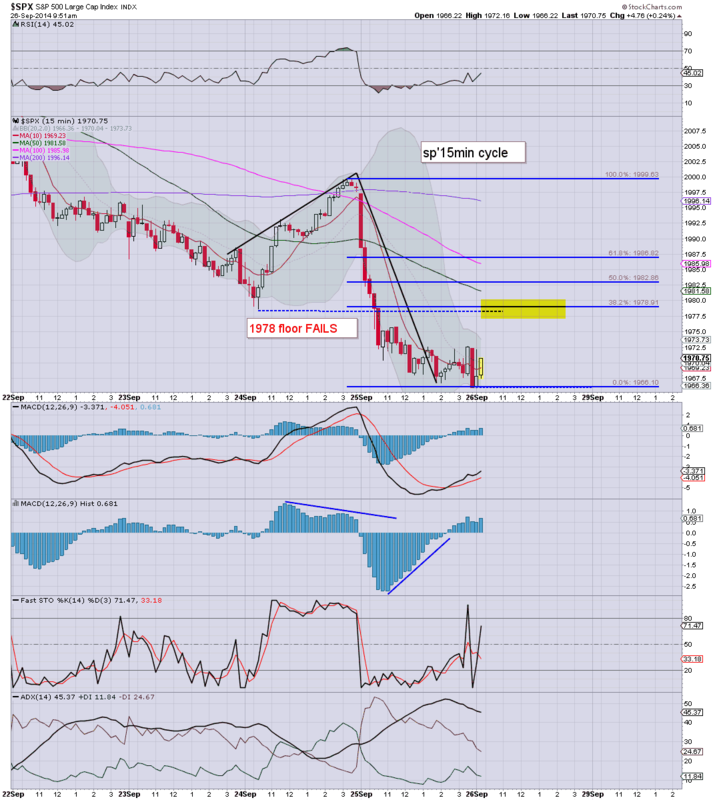 sp'1980...with the smaller 5/15min cycles all over-stretched. Last 90mins of the day going to kinda important, need a close back under 1975 or so to offer an initial setup for next Monday. 2.24pm... approaching afternoon turn time of 2.30pm. With the smaller cycles as overbought as they are a rather typical 'nonsense ramp'....I'd be surprised if we don't at least cool back lower to the mid 1970s by the close. So... I've made my move... now its the waiting the game. 2.45pm.. sp'1985.. pretty impressive for the bull maniacs...hell...they'll be looking for the 2000s on Monday. *I remain on standby to take a significant short-index position, somewhere around sp'1978/80. Price action is very much in the style of a typical bear flag/consolidation. Equity bears should not at all be concerned if we continue a little higher. Typical afternoon turn time is 2.30pm.... if we're around sp'1978 then... I'll start hitting buttons. 1.24pm.. sp'1974... we're getting real close now. ...standing by.... could be another hour... but...its looking pretty good. 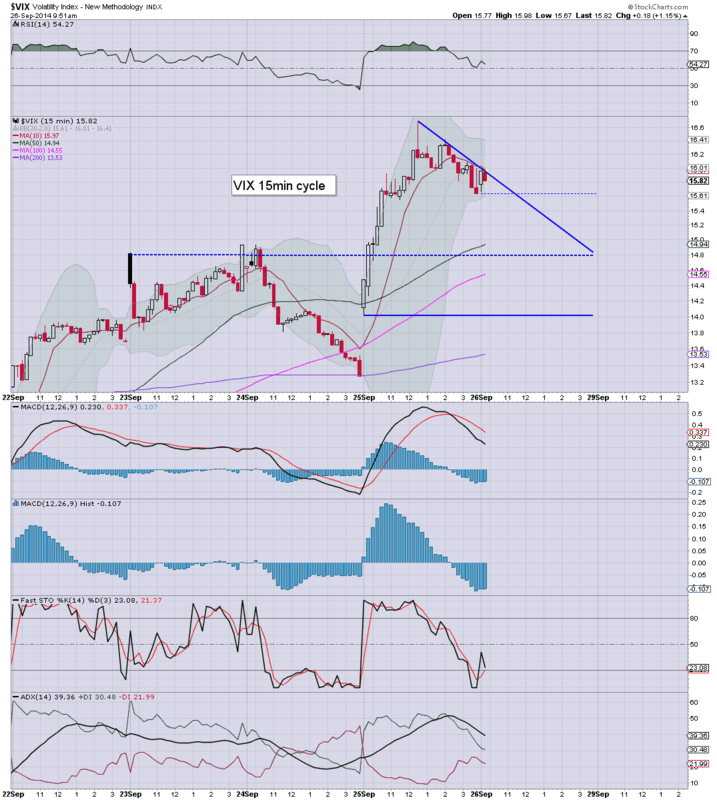 1.28pm.. VIX 15.13... approaching the target zone. US remain weak, and the bulls are really struggling just to manage a 38% retrace of the Thursday decline. Another minor wave higher to the broken support of sp'1978 still looks viable, which would likely equate to VIX in the 15/14.80 zone. Suffice to say..it sure is turning into something of a dull end to the week. *I am on the sidelines, and considering yesterdays' technical breaks, I will still look to short the market... but am trying to at least find an entry around 1978/80. 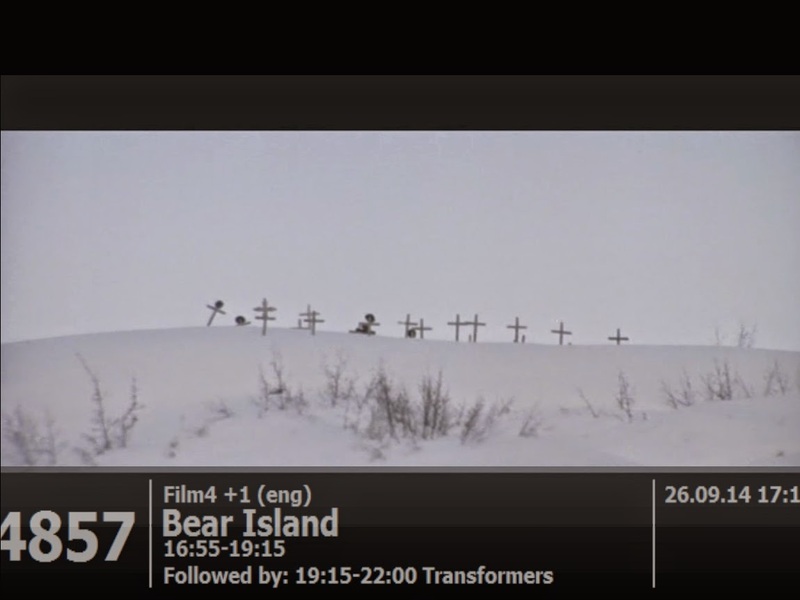 Somewhat appropriate movie on TV this late afternoon. US equities remain moderately higher, but clearly, the bulls are struggling just to get near the old broken support of sp'1978. The nano 5/15min cycles are still offering a classic back test.. but perhaps that will take until the mid afternoon. All those who respect the technical damage done yesterday, should be treating this mornings bounce...as just that...... a bounce. *I remain seeking to short the market, I sure would prefer a short from 1978/80...rather than chase it lower below yesterdays close of 1965. 11.04am.. I think we're getting pretty close...maybe just 10/15mins away. No selling pressure like yesterday.. but neither are the bulls able to muster much. Looks like we'll battle slowly higher into mid afternoon. 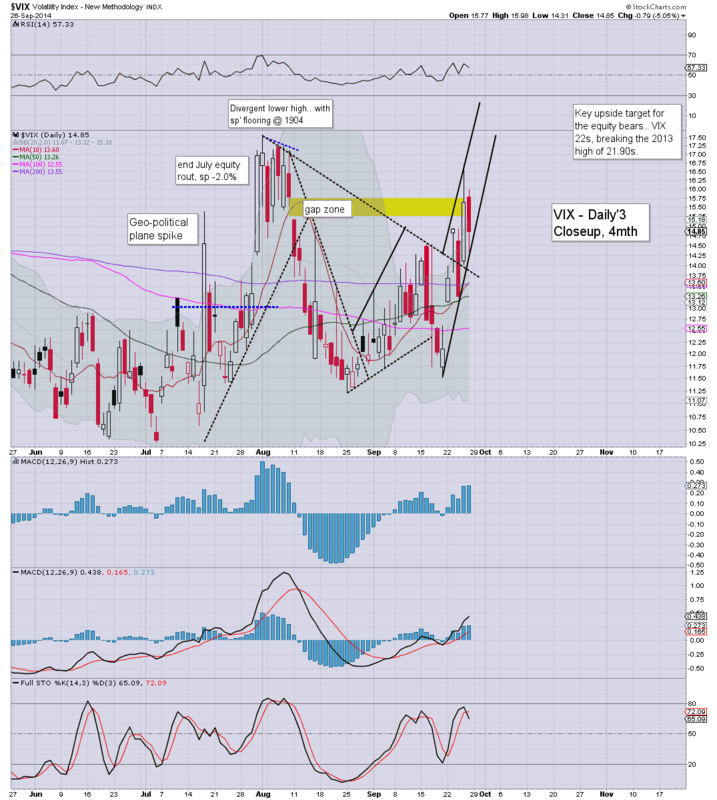 VIX -1% in the 15.40s... I'd really prefer an index short from the 15.00/14.80 zone... at current rate, that is good two hours away. So.. some rather muted opening action. Bulls should at least be able to manage a minor rally.. if only to get stuck by 11am. Prime time for a turn would be 11am... with a red close in the 1950s... but I realise that would be a bold outlook. 10.28am... Bulls still battling this higher...if slowly. Seeking indexes to max out around 11am... 1978/80. Good morning. Futures are moderately higher, sp +7pts, we're set to open around 1973. A back test of the broken neckline - around 1978/80 would be very natural, before more fierce downside. Equity bears should be seeking a VIX weekly close >17.50. So, we're set to open a little higher, and it won't take much to get a little follow through to at least 11am. 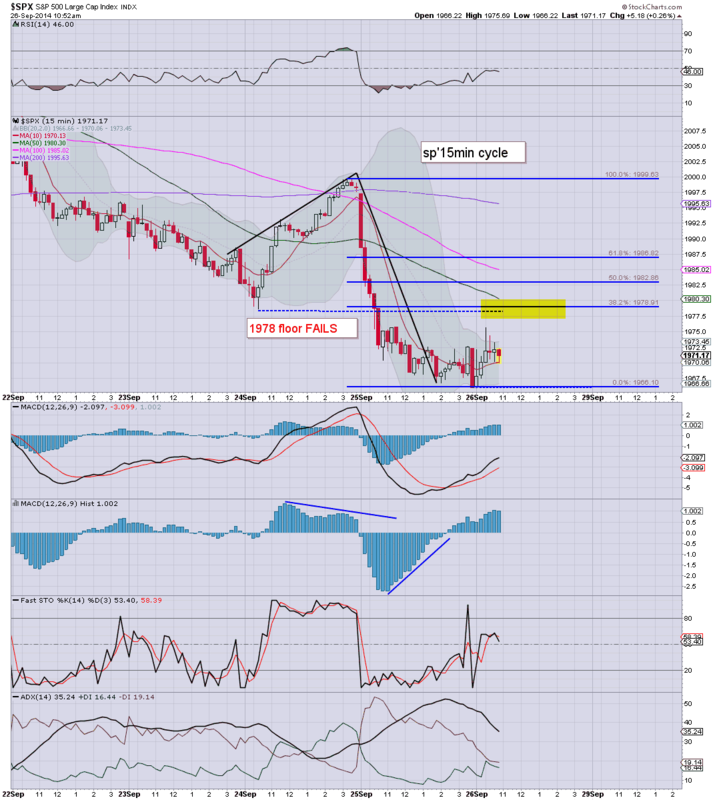 *I will look to short the market around 1978/80 this morning, once the smaller 5/15min cycles look maxed out. Target downside is at least 1950/40 next week, although as many recognise, the 1920/00 zone is possible... with price action as it is. 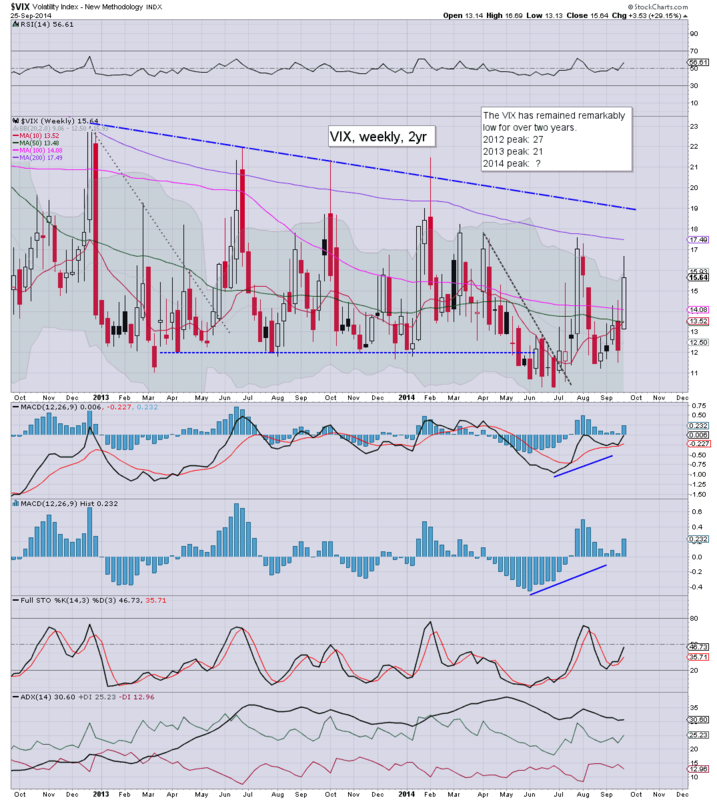 A daily close of VIX >17.50 would be VERY significant, and be the first weekly close above the 200MA since late 2011. It is certainly something I'd like to see to end this week. 8.31am Q2 GDP (rev'2) 4.6%, inline with expectations... the highest growth rate since 2011. Indexes holding moderate rates.... it sure looks like we'll be testing 1978/80 by 11am. 8.39am.. Bill Gross leaves the giant bond company... PIMCO for Janus.... hmm, interesting little story. Clown finance TV are going to be obsessed with that for much of today. Eyes to the ViX... will be watching for that to level out in the low 15s. It is certainly suggestive we'll build equity gains this morning. 9.43am.. minor chop... VIX a touch higher, but nothing for equity bears to get excited about. I think its a case of lets see where we are at the typical turn time of 11am. US indexes only opened moderately lower, but with the failure to hold sp'1978, there was continued selling, and we saw a style of price action not seen since late July. The bigger issue now is how low can we go into October... and across the fourth quarter? Perhaps the most important chart to highlight right now is the R2K. I've been dismissive of it for months - since it has effectively traded sideways, stuck between the 1210s and 1080s, but after 8 blue monthly candles... we finally have an outright bearish red candle. There is also a break of the primary upward trend, with first target downside of around 1000, with secondary in the low 900s. For the equity bears (and yes, I'm still one of them at heart), the closer we can get down to the August low of sp'1904 the better. If the current wave continues to at least the 1920s, it will offer a very large H/S scenario. 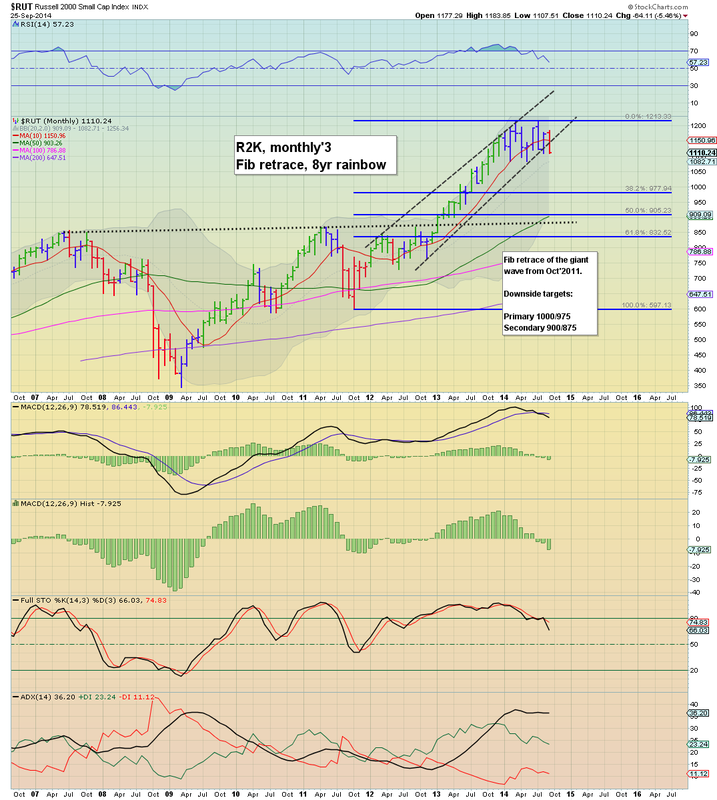 A bounce in mid October - probably to the 1970/90 zone, would make for the dream re-short. A simple trading stop of course would be somewhere in the low 2000s. Right now the hope of the 1700s before year end is a mere hope, but if we can battle to the low 1900s next week, I'll strongly consider that Alibaba marked a key intermediate top at sp'2019. We have GDP (second revision).. market is seeking an upward revision to 4.6%. That seems overly optimistic. There is also consumer sentiment around 10am. Once again we're brushing the important $3 threshold. 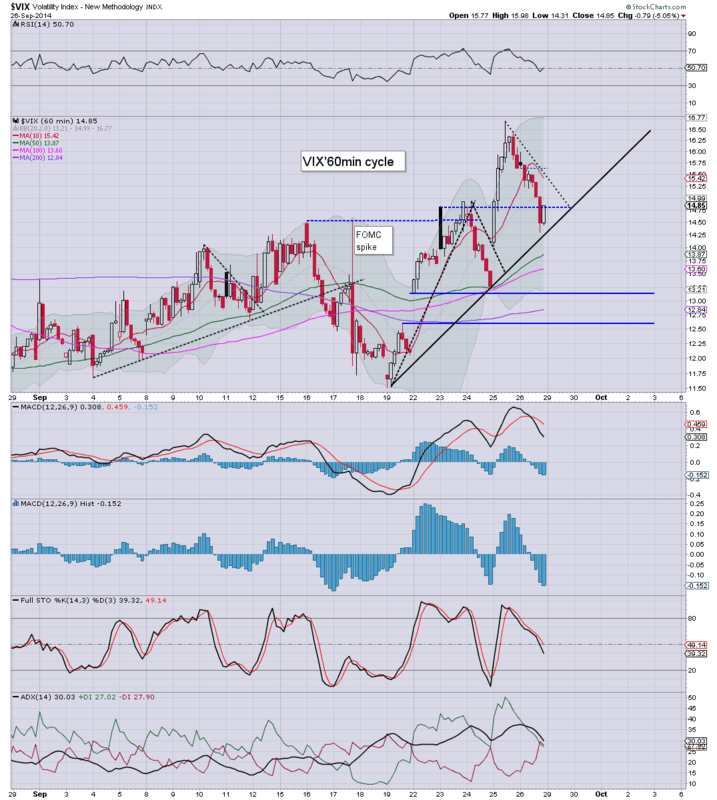 Those deflationary bears seeking a key equity top should certainly be keeping an eye on Copper. Primary downside target would be the low $2s. Those seeking an equity inter'4 down, should look to summer 2011 at the inter'2 wave in Copper... a huge down wave... which right now would indeed result in the $2.25/00 zone before year end. 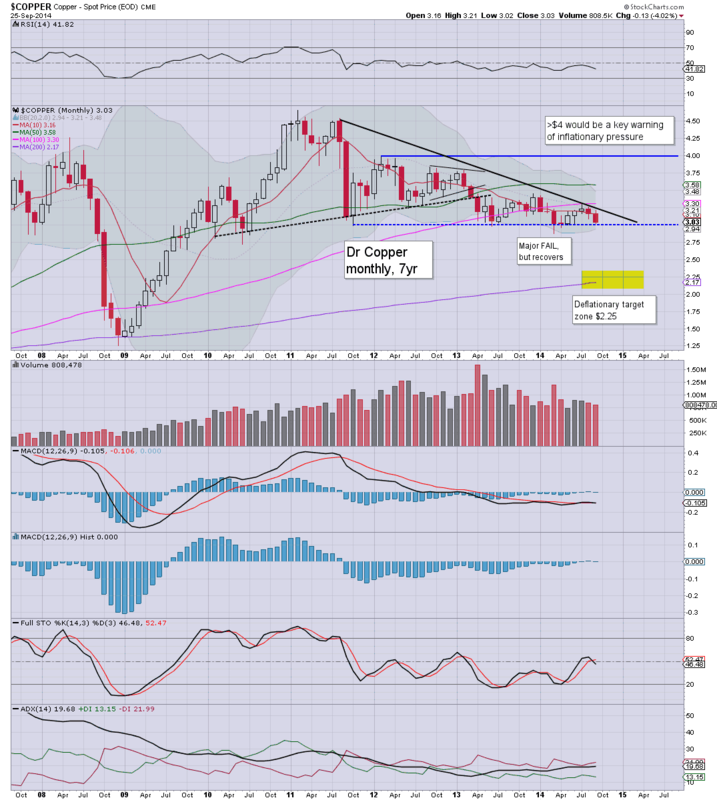 If Copper remains weak, it does not bode well for the precious metals - especially the more industrial Silver. Further... if the metals continue to decline, it would keep downward pressure on the mining stocks. Certainly, I'm surprised at how today panned out. 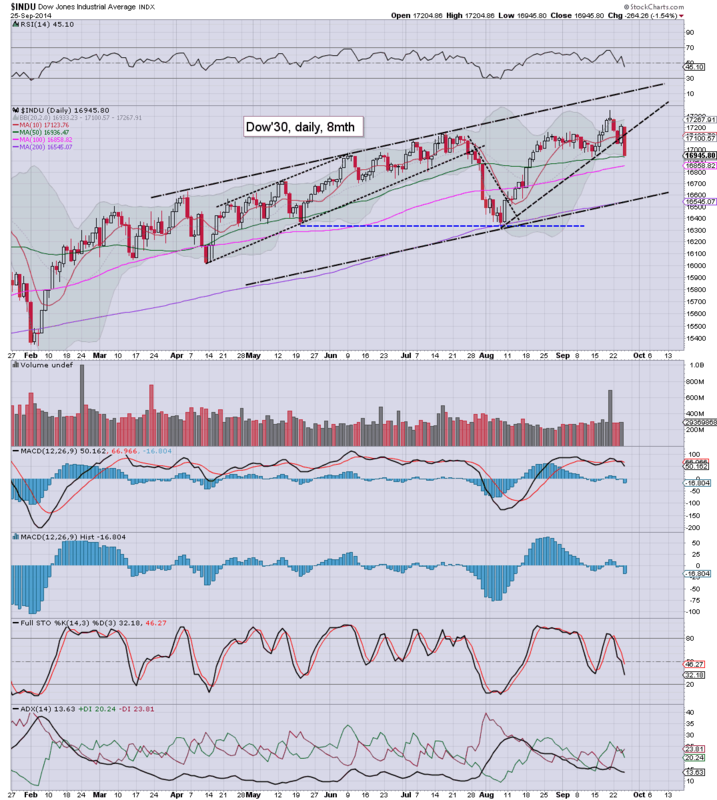 However, as noted in the morning, once key support of sp'1978 was taken out... 'something new' was clearly underway. I will always endeavour to be open minded on days like today. It has been a busy day, but I wanted to say thanks for the emails/messages, I do appreciate it. I can only hope the market does finally see an inter'4 wave down... its been a long time coming, and those few bears that are still around, sure as hell deserve some profitable entertainment into year end. As ever... make of that...what you will. 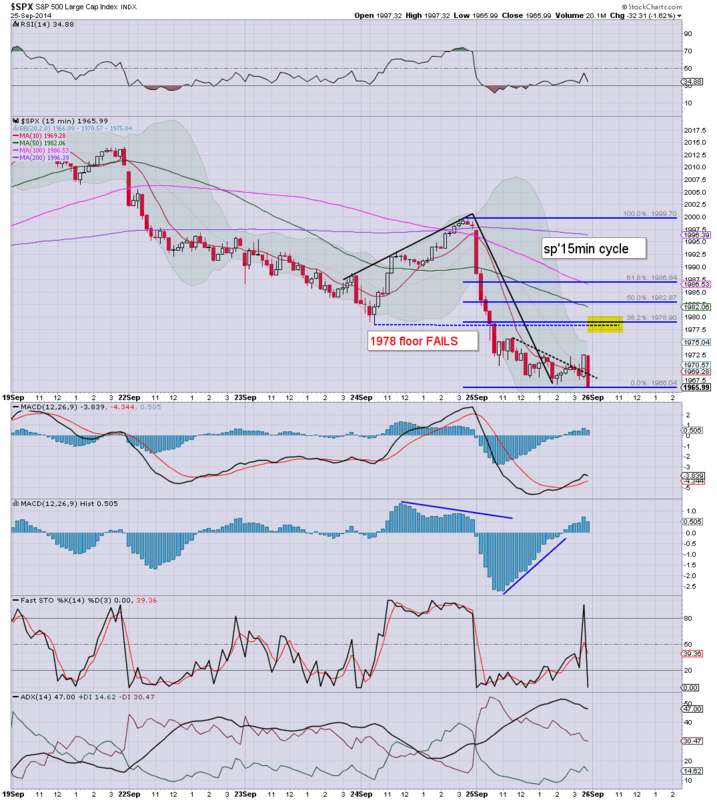 US equities saw some rather significant declines, having failed to hold the important sp'1978 floor. The sp' settled -32pts @ 1965. The two leaders - Trans/R2K, fell a significant -1.4% and -1.6% respectively. 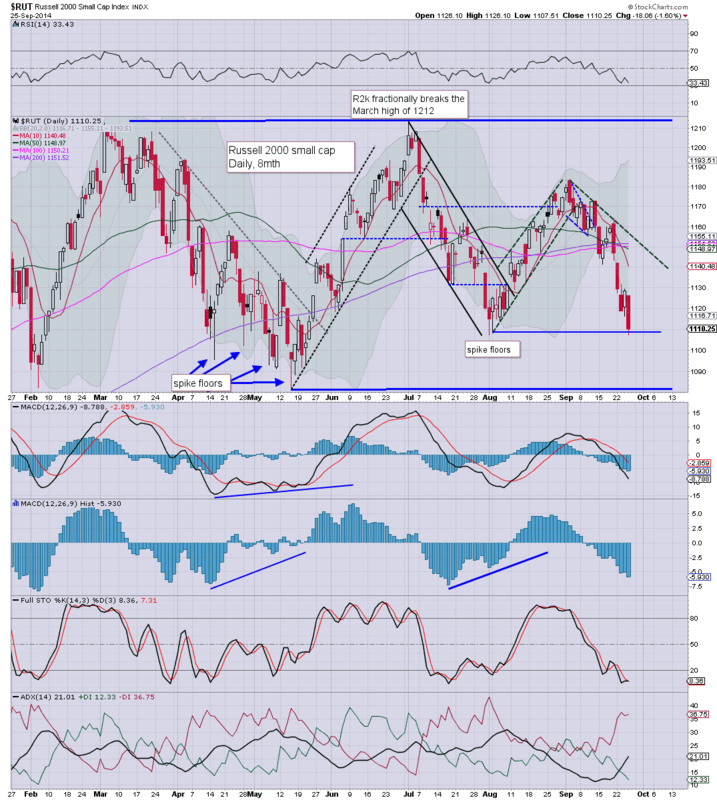 Near term outlook has turned very bearish. We saw an awful lot of technical damage today. Not only was the recent low of sp'1978 taken out, but the 50 day was broken. There is little support until the price cluster zone of 1950/40. Primary downside target for the particularly bearish 'doomer bears' should be 1920/00 by end of next week.